Despite their stature as the tallest land animal on earth, and status as one of the most iconic and beloved species in the world, giraffes have been quietly disappearing from the landscape at an alarming rate with little fanfare in what conservationists have dubbed a "silent extinction." Since the mid-1980s, their population has declined by startling 40 percent, leaving only an estimated 97,560 individuals in the wild. The staggering drop in numbers recently prompted the International Union for the Conservation of Nature (IUCN) to change their status from Near Threatened to Vulnerable on the Red List of Threatened Species. Sadly, they continue to face a host of threats ranging from conflicts with us and habitat loss to climate change and being killed for sport by trophy hunters - who are largely coming from the U.S. and have imported thousands of trophies and other parts over just the past decade. In response to concerns they may soon go extinct if we don't act to help, five animal advocacy and conservation organizations have joined forces in an effort to secure their future survival and to ensure the U.S. isn't complicit in their decline by seeking protection for all giraffes as Endangered under the Endangered Species Act. Listing them would help by banning most imports of trophies and parts coming into the U.S., and regulating domestic trade, in addition to helping raise much-needed awareness about their plight and generating funding for more research and in-situ conservation efforts to protect them in the wild where they belong. 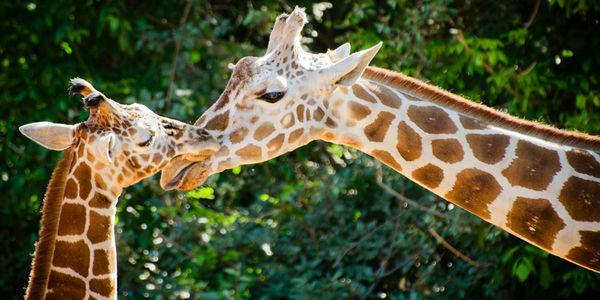 Please show your support for protecting giraffes as an endangered species by signing and sharing this petition. As someone who is concerned with issues surrounding wildlife and endangered species, I was thrilled to learn that the U.S. now has an opportunity to act to protect one of the most iconic and beloved species on earth from disappearing–should it choose to do so. Since the mid-1980s, the population of giraffes has declined by startling 40 percent, leaving only an estimated 97,560 individuals in the wild. The staggering drop in numbers recently prompted the International Union for the Conservation of Nature (IUCN) to change their status from Near Threatened to Vulnerable on the IUCN Red List of Threatened Species. Unfortunately, they still face numerous significant threats to their survival, including pressure from a growing human population, human-wildlife conflicts, disease, habitat loss and fragmentation, predation, civil unrest, drought, climate change, poaching and trophy hunting. It's also unfortunate that the U.S. is playing a major role in their continued decline. In just the past decade alone, the U.S. imported 21,402 bone carvings, 3,008 skin pieces, and 3,744 sport-hunted trophies. Concerns that giraffes are facing extinction recently prompted five conservation and animal advocacy organizations to formally request that the U.S. government protect all giraffes as Endangered under the Endangered Species Act (ESA). Listing them would significantly help reduce major threats by imposing strict regulations on imports, exports and the domestic trade of trophies and parts, in addition to helping raise much-needed awareness about their plight and generating funding for more research and in-situ conservation efforts to protect them in the wild where they belong. Above all, it would ensure the U.S. isn't complicit in their further decline. I sincerely hope you will act to ensure the U.S. plays a role in ensuring giraffes remain part of the natural landscape by extending the greatest level of protection possible to them under the ESA.